In Furniture > Chairs > Show & Tell. This became a gift for a friend of ours. 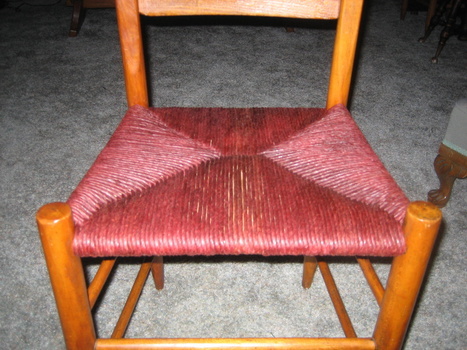 It's a nice slat back with a dyed fiber rush seat the chair is made of maple you can see the tool marks in the wood from the draw shave. Hi James, I have 4 maple arm chairs at my breakfast table that have the same exact design in the seat. And a 5th exactly like them except that one has arms. (captains chair?) Only difference is that the five I have, have seats that are in a natural tan color. Other than that, they are exactly like the one you have pictured "seat wise". The chairs were left to me along with the round pedestal "tiger oak" table by my mother. They were where we ate the entire time I was growing up so I think they may go back to the "mid-late" 1950's. Heck, they may have had them before I was even born, which would put them back to the early 1950's or older. 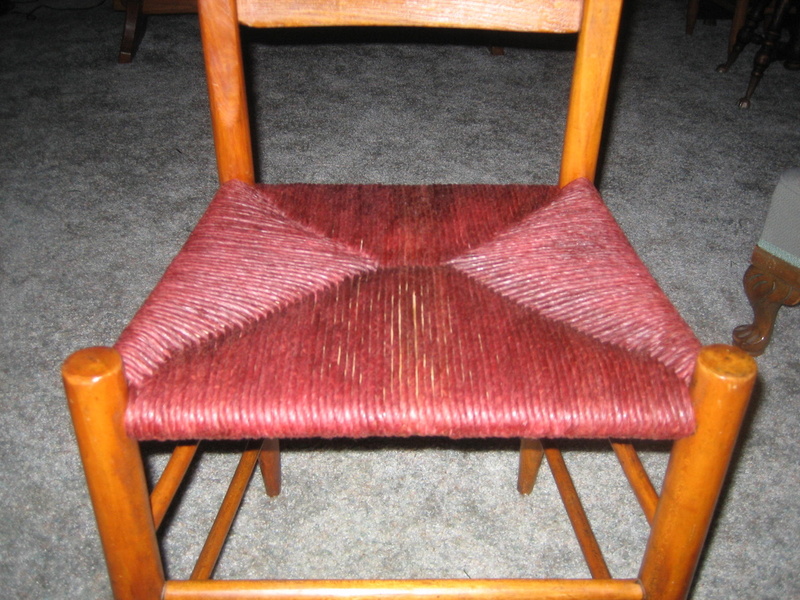 I've never seen this woven wicker type bottom with this 4-piece design before now. You say it's called "fiber rush"? Anyway, very cool chair. I use fiber rush it is heavy brown paper twisted in to a cord. I buy it in large spools buy the pound. If you get the bleached white fiber rush you can color it. I use this instead of real rush or cattails because it is easier and faster to do. 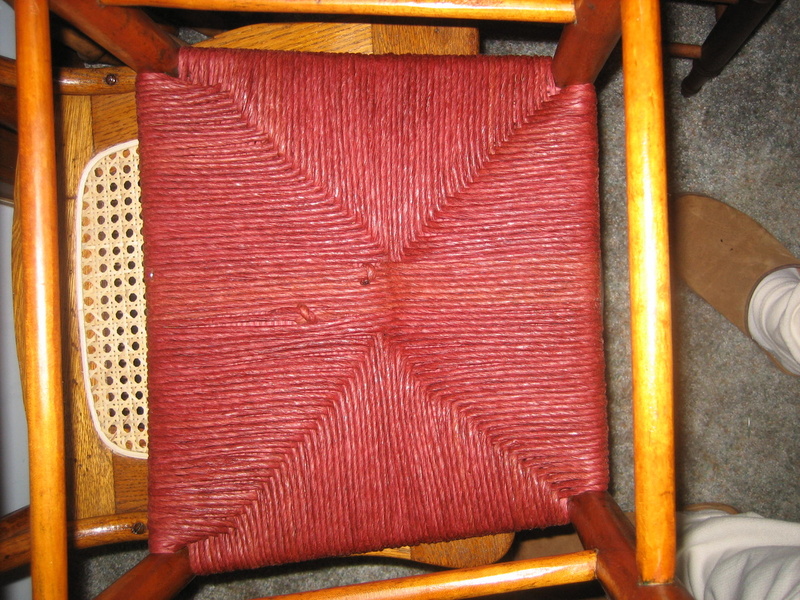 Your chairs could be even older. I would love to see photos of your set I have never seen an arm chair (captains chair) in this type of chair. Yes I need a few chairs redone? 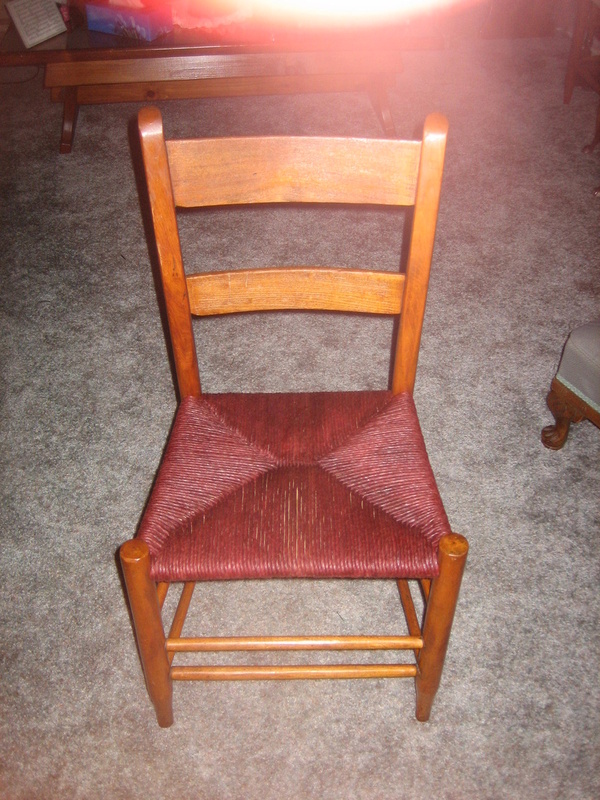 I will post a pic tonight of both the arm chair and one of the other 4 chairs like it without the arms. Please take a look at them and let me know what you think I have. I have thought all day about when my family may have got these maple chairs and I'm sure it was in the 1950's sometime. 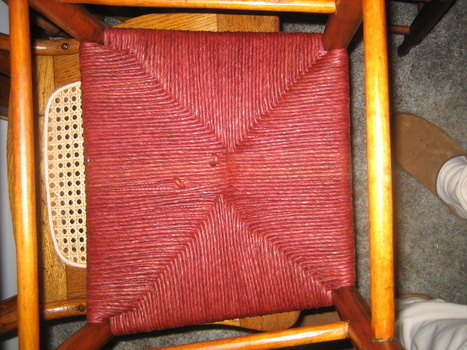 But due to lack of funds, they may very well have bought them used which means the chairs could date earlier. But if they were new or if they were used I just can't say. Maybe after you see them you could share some info on them and possibly tell me exactly what I have. Thank you in advance for any help or info you can lend. John........ E mail me at jim.boerman@gmail.com my wife got to my bags after I got home and I can't find anything I brought home now.